As the finish line comes closer the working hours increase enormously and the track of time gets lost. It has been one long week since the last post, and I believe that is how it is going to be from now on. the isolated parts for the new version. I'll upload it soon. The evolution of the first video, still a lot of details to take care of, but a big improvement from the first concept. 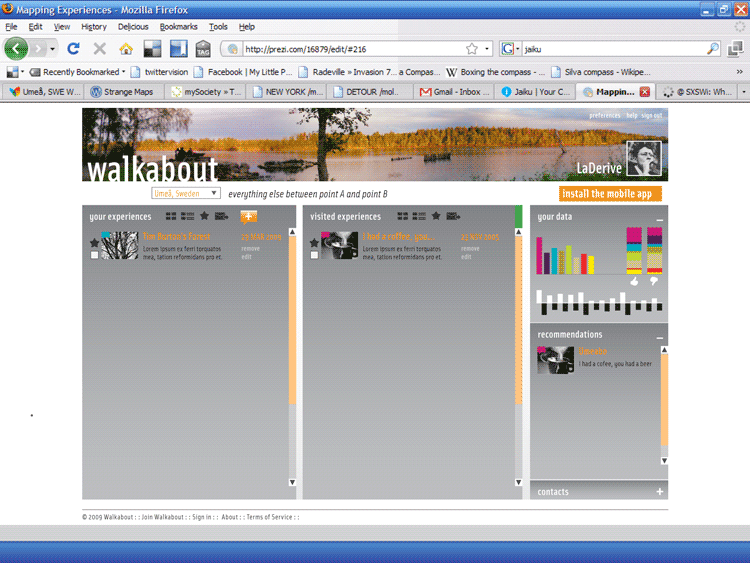 This is the first video scenario of Walkabout. Some of the behaviors are still incomplete, but that's the focus of work at this stage. Refine is the word! This week as the graphic explorations are becoming more concrete, I started adding the behaviors and trying the Walkabout service in motion. The first try resulted in the video above. Incomplete as it is, I could get important feedback from it, regarding the transitions when the user turns direction. This movement of turning has range, could be a wrist motion, an elbow motion or even a shoulder or torso motion. I want now to run a quick test with users to observe this detail and refine the transition accordingly. 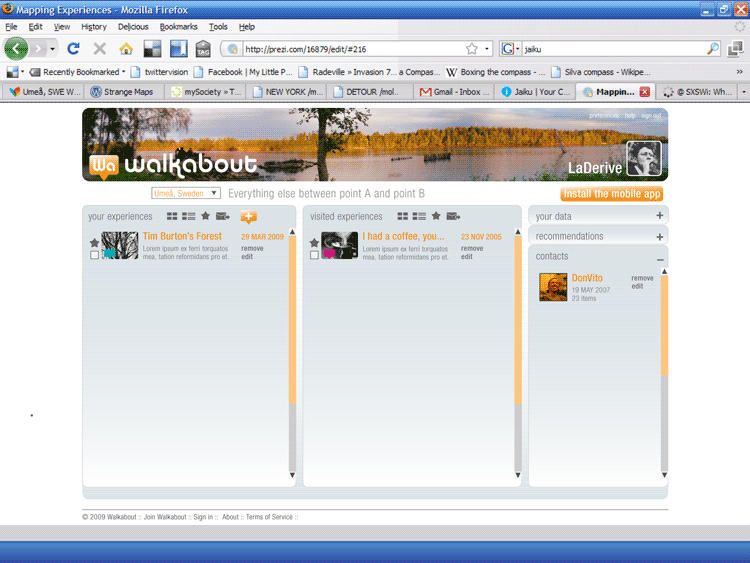 Users regarded the Walkabout interface as being too serious, and looking more as a professional tool than a playful service that should be used in the spare time. I guess that I was imposing my own aesthetic values upon the interface and the refinement is bringing it to a more appropriate configuration to the purpose of Walkabout. background didn't get any votes. 12 and 15, the only difference is the typeface. you can mess around with harmlessly. My conclusion is that they are both right, it's a matter of choice, context and being appropriate to the project. radius to each one of them. I understood that the bigger the radius the more friendly. City homepage, before the user logs In. User page, with the list of experiences, data, contacts and recommendations. User page, showing the contacts panel expanded and data and recommendations closed. and the right language. See some examples of the wireframe and the previous, more serious version. and relaxed nature of Walkabout. you want the experiences to be displayed and fine tune the moods, represented by the color dials. there" function to take users to the exact point of the experiences and the icons in the menus in the common screen. the notification setup, going from don't notify me when talking, don't notify at all and mute system. by side to make sure what works best. way from the screen to accomodate the less precise pointer, our fingers. interface elements for the final feedback session. give them a face and behaviors. way that I could have the Setup and Active Mode as two faces of the same coin so to speak. Looking closer at the "radar" interface in AV mode [on top] and setup [below]. So, after the Sensing and Sensuality event on Friday, I had a discussion with Jack Schulze about my project last Saturday. dig for them so much? experience is about. Time to think it over. the mobile device and have a website companion. So I started wireframing them both. and what should and should not be developed in the scope of the degree project. of experiences that would be updated over time and of course according to location. install it (screen down) or learn more (screen to the right)]. I am defending in the service's concept. Time to redo it again. of the general research phase and a conceptual direction is chosen to be developed in the second half of the project. they live in. Take a look at the presentation. experiences in the urban space, not on the screen space. experiences, creating a complete service. which he himself has written." notebook is very interesting. So, I hope to absorb this character by living with them and experiencing them for a while. design a quick prototype in flash to run on the device and iterate with people. type. The invitation provided the login and password to the account. The invitations were not accepted I guess. perceived as an invitation. Lessons learned. Soon the 2.0 version will be released. control over the notification frequency and reason gives the user a better perception of them. listen... it's a good experience! once they are outside my head. and selection of data, things I have been doing so far is also designing. operandi as Brendan Dawes describes so well in his book Analog In, Digital Out. this is only one of the possibilities, and also to be developed further. for it falls out of my reach and interest. 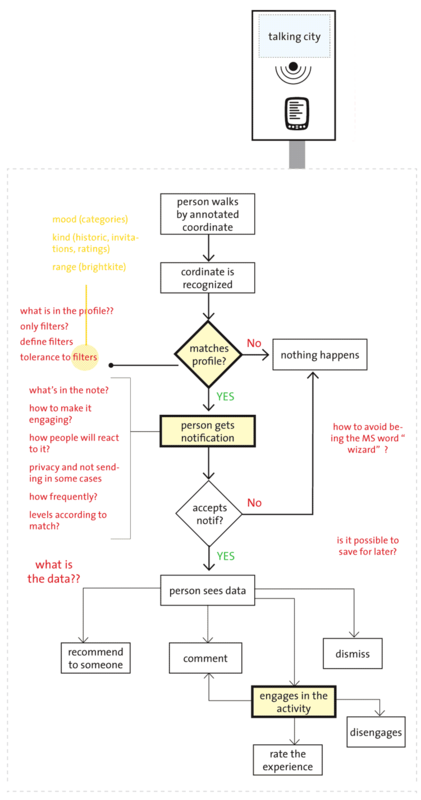 be by notifications and how to make them more peripherical but still noticeable. that by the window the satelite signal was still strong, so I left the device on during the night standing there by the window. school. I wonder if GPSs sleepwalk. the direction of a playful knowledge, based on a nice experience of the content I gathered through an inspired interface. committing so much to one concept or one idea. my project to be kind of a digital moleskine, that has a private and also a shared side. the force lines and flow are always expressed in the design, so I feel like there are similarities that could be explored. ways of dealing with maps and globes to insert in the interface. Analog In, Digital Out. By Brendan Dawes. Google Maps Hacks. By Rich Gibson and Schuyler Erle. the main patterns and sketching the interface. I should be paying attention in the project. vices through the web. The content focus is still a little bit different, but not enough to make an interesting project. And also it deviates a bit from my original intent of taking the map out of the screen, and make the terrotory the map. ledge actionable? Are there other kinds? Sky: Abre los Ojos - Open your eyes. To me that's more than a valuable endeavour, it's a necessary one. And what better than maps to carry this information? 6000 words of texts and 51 "experiences". Thanks a lot to all of you who shared them with me. this technology is not ready to perform satisfactorily. visualize the system structure. That's the task for next week. explore the possibilities in the map. methods, I'm trying to figure out how to frame the mapping system in a useful and interesting way. Interesting talks with Mattias Andersson and my classmates have brought some questions and ideas in this regard. this experiences around the city can turn out to be actionable knowledge. Maybe it doesn't have to be. I am not sure. curiosity appeared more than once, for example, but FIND is the most common word. really makes me believe that the territory should be the map. This is one of the big questions. Can I make the city talk throught the maps? stop and figure out where the research was going, what I am getting from each front. come out during the process and would require some schedule space. blishing the weekly findings too. knowledge to be used in the analysis and combined multiple times to the concept generation. in Umeå asking them to share with me stories that they have lived, known or witnessed in the urban space of the city. when they are talking about them. There are 2 hours of video to be decoded and transcribed now. round of the users is irrelevant at this stage and wasn't considered in the survey. that Interpretation is crucial to maps. So, from this experiment I wanted to extract conceptual models made by experts on the field on the utilization of maps. This will help me understand the meaningful activities and semantic avenues that derive from them. thankful. This questionnaire won't take you more than 5 minutes to fill up. degree project to the rest of the school, presenting their subjects, sponsors and work plan. ment of the project, something to stick to during the process. where they are currently displaying an exhibition about Maps called Mapping the Contemporary. translation. One other, Nokia Vine was shown to me by my classmate Mikko, but I still haven't taken a deeper look. Below, on the links session, you can find access to both services. away from the subject, but still under the big design umbrella. similarities and differences in the understanding of these information devices. >> There's so much data available, what would users like to know? The anthropology of experience, by Edward M. Bruner. where I've been and what I have done. space by the creation of digital annotations in space of individual or group experiences. abstraction derived from something, or a reaction to it, is not the thing itself. what is experience. I have been reading a book called "The anthropology of experience" edited by Edward M. Bruner. Other readings have been "The image of the city" by Kevin Lynch and Songlines, by Bruce Chatwin. knowledge obtained from life, the latter means more a remarkable instant or event that people go through. places? How would you express it ?